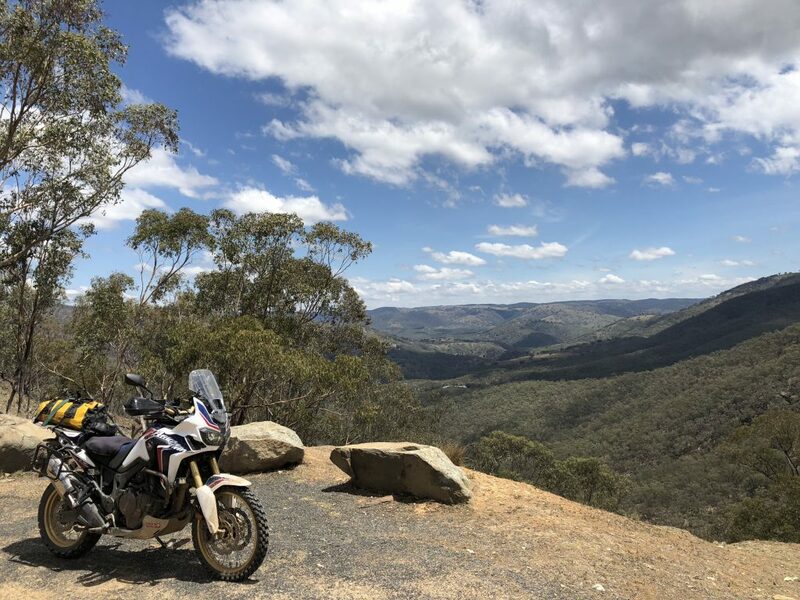 The weather forecast looked comfortable for summer so the Good Ol’ Boys decided to head back to the Bridle Track between Bathurst and Hill End NSW and ride it both ways (and them some) today. Last night though the Bathurst Region was hit with fierce thunderstorms as were all our respective home locations. I left home at 4.45am in the rain to meet Rob at Blaxland at 7am. It was foggy but thankfully not raining across the Blue Mountains. The sun was out at the next stop, Bathurst, where we met up with Karl. Transport leg of 333kms done. After coffees and chai we were on our way to the Bridle Track interested in how it was going to be given the dumping the area had received. Here we are off the tar and about to get into the fun stuff. The start of the track was pretty good, the only thing the rain had done was keep the dust down, nice! We got up past the rock fall that closed the track to vehicles, although I can’t see why anyone would drive up there, it’s tight! But the view is sensational. In the next part there were plenty of muddy potholes of all sizes and depth. 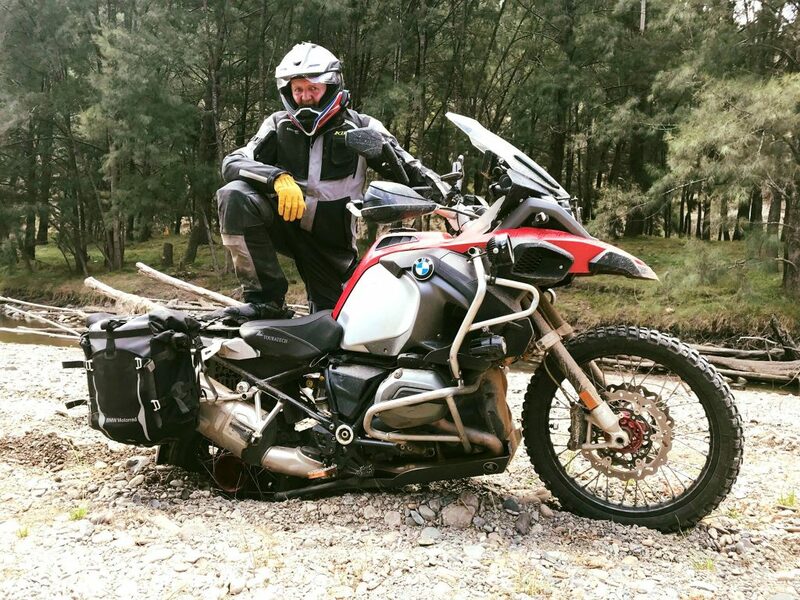 Rob just rides through them, I pick my way around them where possible and Karl, well a couple of times he just made it look hard but managed to keep it together while laughing wildly… just. All in all though, the track was a bit wetter than last time but quite manageable. Surprisingly the causeway, which had water running over it last time we were here, was dry. What we did notice was a huge hole in the causeway where it’s collapsed, it’s on the right heading from Bathurst so keep left/centre or it will swallow your bike big time! From there up the rocky, gnarly hill to Hill End. Karl must have got a sniff of a beef salad roll! 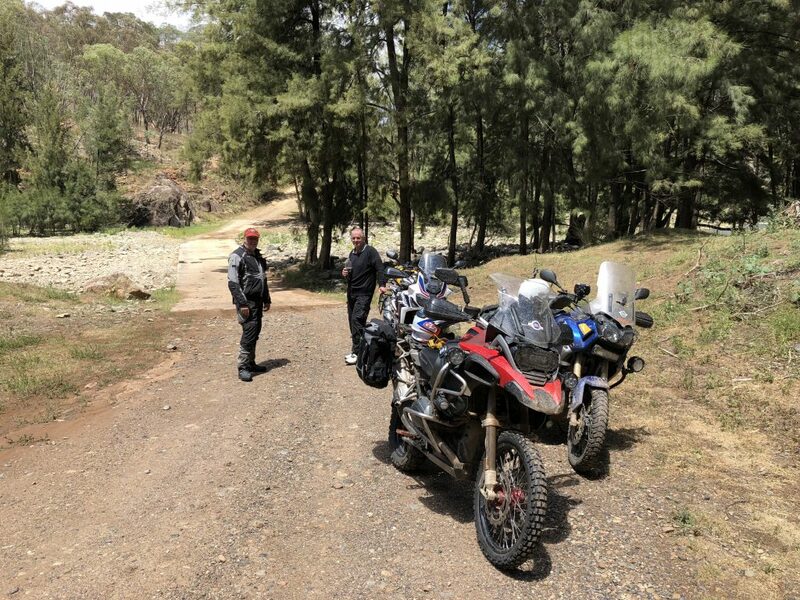 After lunch and a chat we headed back to the track to ride back to Bathurst deciding to poke our heads down some of the side tracks to break it up. Here’s a little lookout you don’t really see riding up the hill. 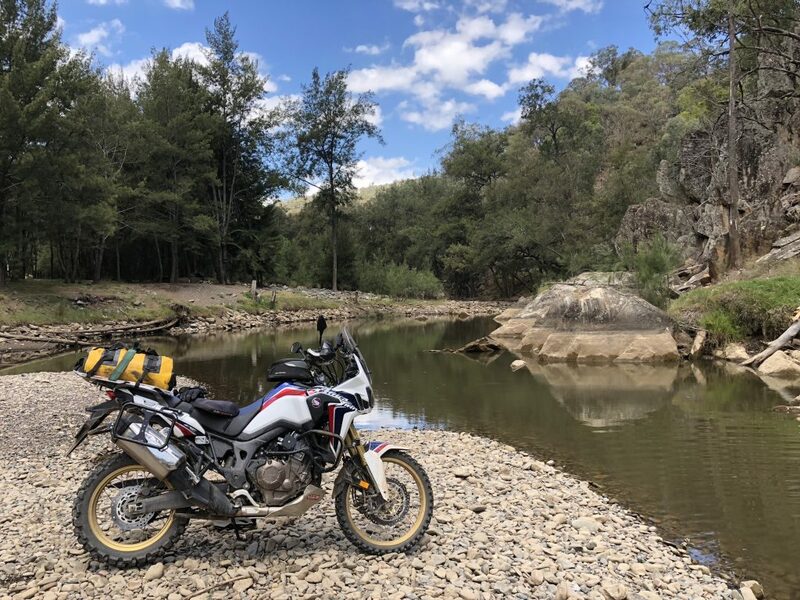 Back at the causeway we decided to test our skills on the rocky river bed, there was a great spot for a pic and the Africa Twin’s side stand worked fine. Rob thought he’d save some wear and tear on his very fancy adjustable after market stand. 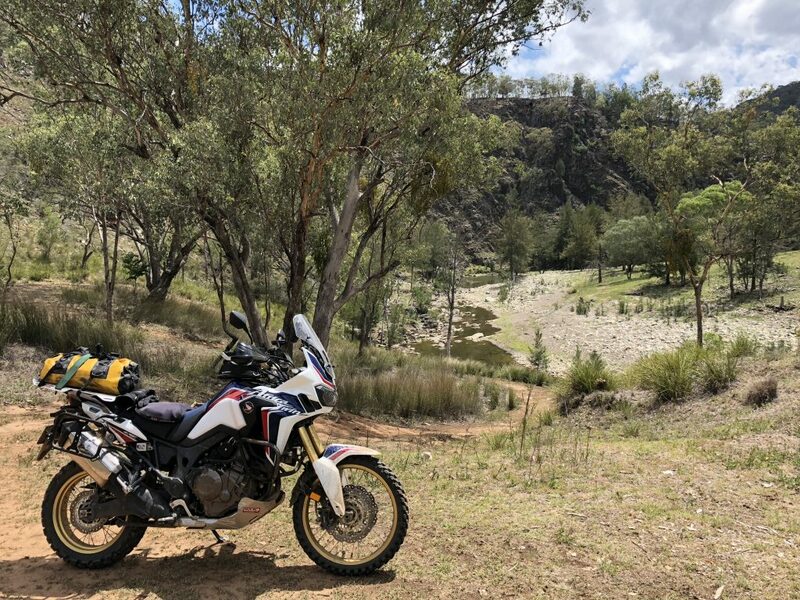 After mucking about there for a while we kept heading towards Bathurst and decided to have a look At Mary Flynn Reserve. 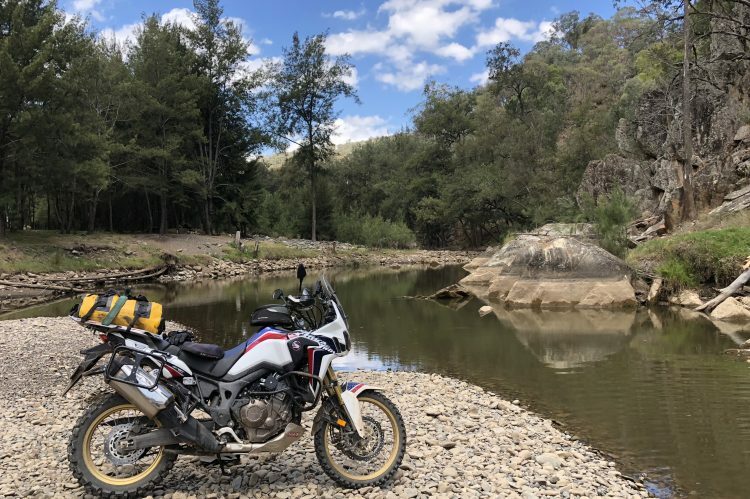 A lovely spot with a bit of a tricky ride down. If you look behind the bike you’ll see a dirt loop on the hill. I decided to give it a crack. Down was fine, up just the other side of the trees didn’t go well. I ended up doing everything you shouldn’t do when you can’t make it to the top and ended , well, on my side. We got the bike back up and I saw the right footpeg left behind. 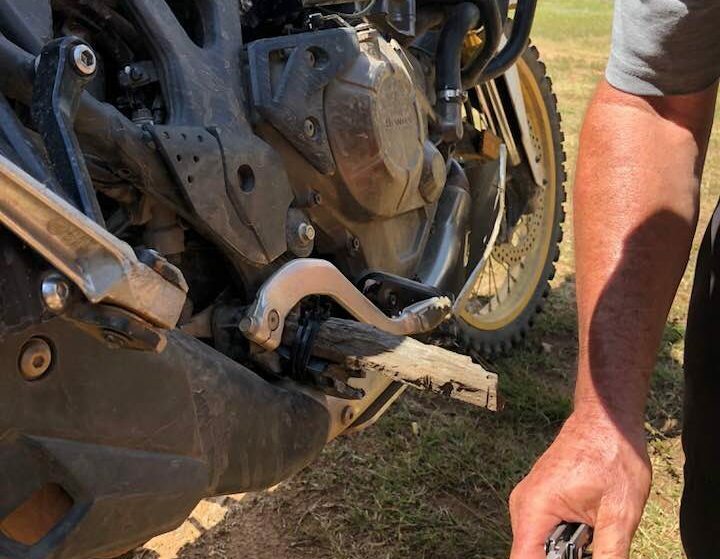 The footpeg bracket had broken. Rob and Karl had a great crack of fixing it McGyver style. It actually worked for a while. After that I was resting my boot on the stump of the bracket and the exhaust cover. Not entirely comfortable but good enough. 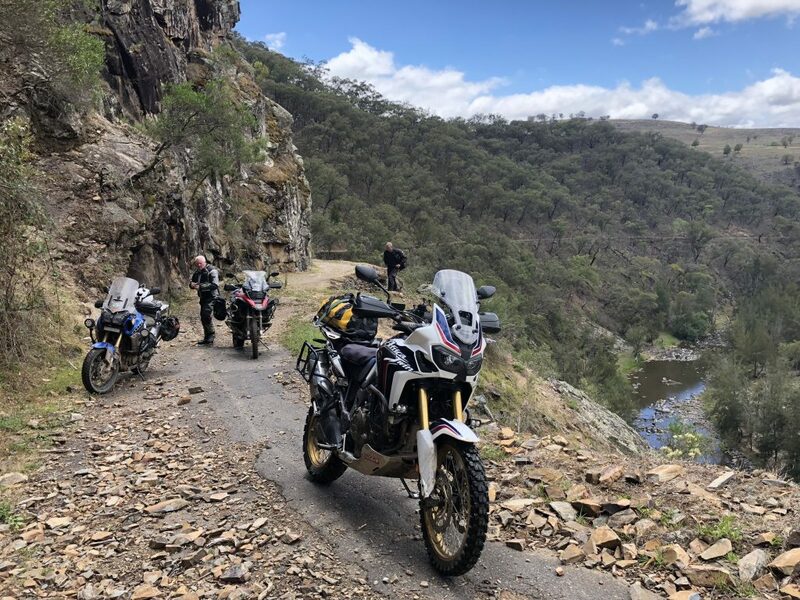 We had decided the best course of action was to head back to Hill End, the shortest route back to the tar and loop back to Bathurst. I was going to try to get there before the Honda Dealer closed. 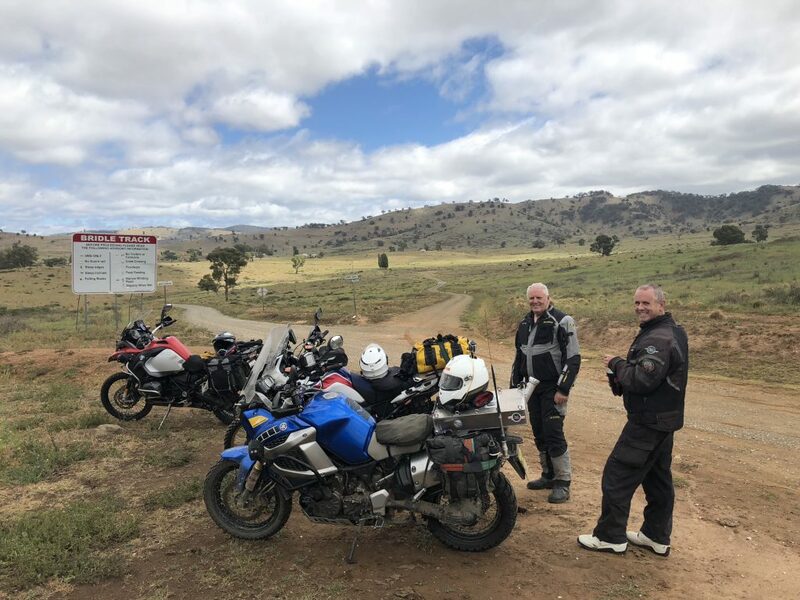 Rob stopped at Hill End for a drink and Karl and I took the road to Sofala (wow what a fantastic set of corners on that road!) and Wattle Flat. 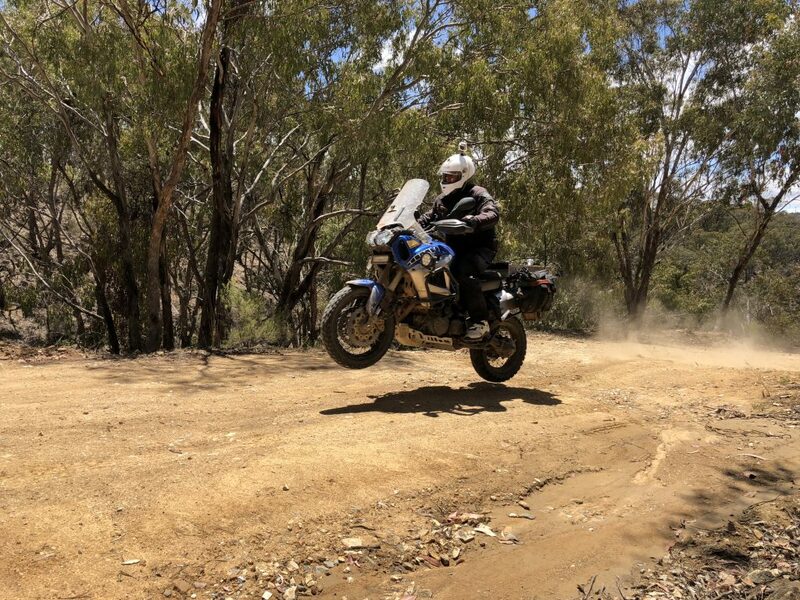 The up side, you can definitely crank a bike over further if you don’t have a footpeg! Rob took a short cut and beat us to the dealership. They were great there and considered providing me the part off a new stock bike. Unfortunately, there was no replacement bracket in the country, so no eta for their replacement so they quite rightly decided against handing it over. Thanks anyway guys! They laughed when I asked what they’d give me for a trade for mine with one footpeg for their nice new one. Then it was back to the Panorama Motel for a debrief and some fake hydration. 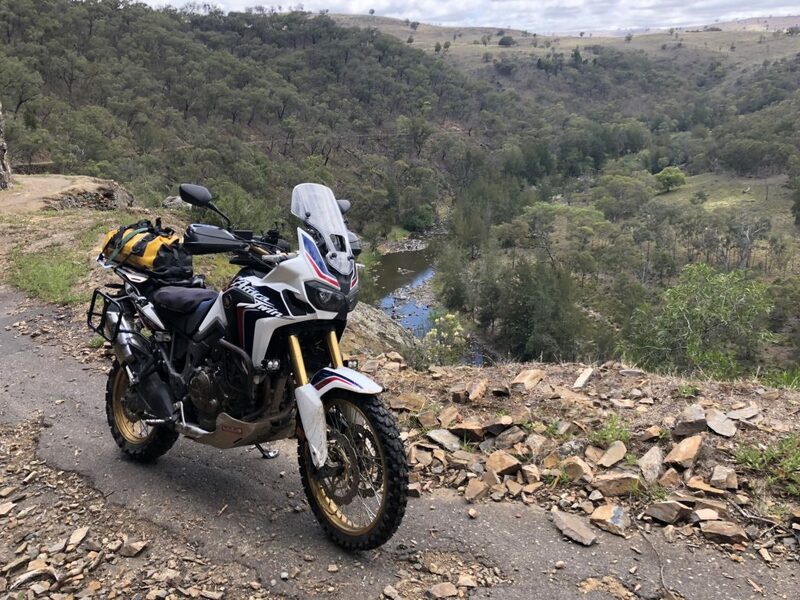 Tomorrow we had planned to ride through Oberon and on to Wombeyan Caves Road on the way home. I decided to take the sensible option and just limp home the best I could with the bike the way it was. Epilogue: The ride home was not too bad and the AT now also has a blown fork seal to sort out. It’s also just past 20,000kms on the ODO. 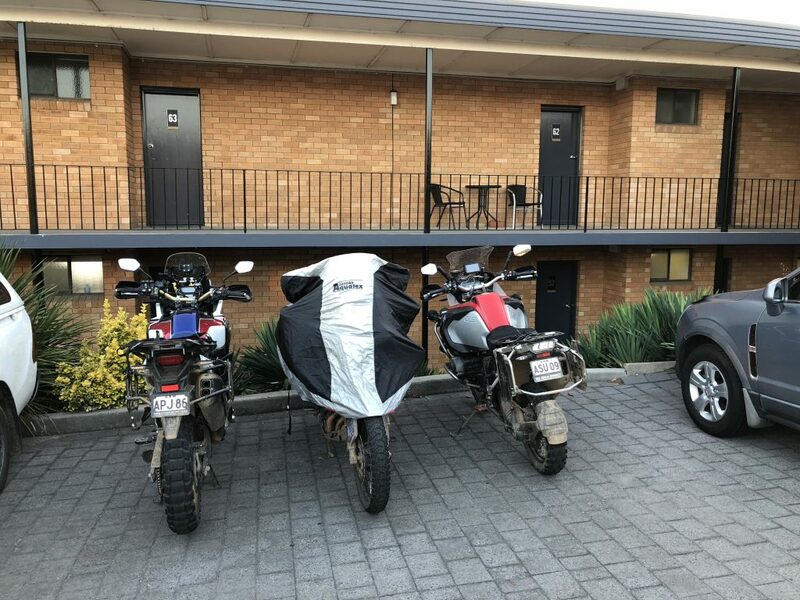 Home to home in a day and a half, about 900 kms. Enjoyed the read and great pics! It was an awesome day for a ride with great guys, loved the mud and the beers that followed.